Good Morning this bright and sunny Saturday morning. I firstly want to thank everyone that left a message or e-mailed me about my spots and subsequent health problems. I had my ride in the big machine only to find that now I have to go for a ride in another a bigger better one - LOL. The long and short of it is that the spots have turned out to be a warning of something not being right in this old head of mine so we are now going to get it all sorted out over the coming weeks. So for those of you that have said you are praying for me - Keep it up and thanks to everyone for thinking of me - It really does help. How are you going with the Baseco bag pattern? Have you started yours yet? It is so easy to make and so much fun plus it is helping the people of Baseco. After chatting with Dawn the other day I have decided to offer pre-cut kits for those of you that are busy or do not like the cutting process. I have them in 5 different ranges and everything is included except the embroidery threads for $40.00 including postage within Australia. 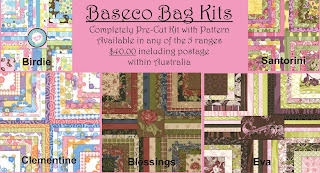 So now there is no excuse for not making a baseco bag - All you have to do is put it together. If you want to see if you can win one pop over to the Among The Gum Trees Blog where there is a draw for some kits as well. Like lots of people I have completely fallen in love with the colours and textures of the French General fabrics. Rouenneries is the first range designed by Kaari Meng closely followed by Rural Jardin and now a new line coming out called Lumiere de Noel. If you haven't touched them yet find your closest store that stocks them - You are in for a treat - They look and feel gorgeous !!! 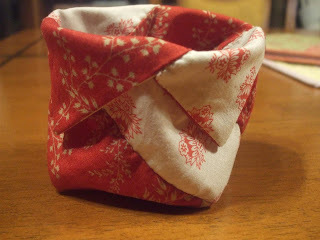 This is a little thread holder that I have been making lots of lately from the Tutorial over at The Stitching Room. 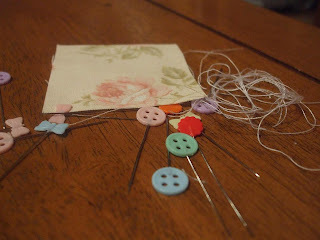 It is so easy to make and perfect for sitting on the arm of my chair for night time stitching. 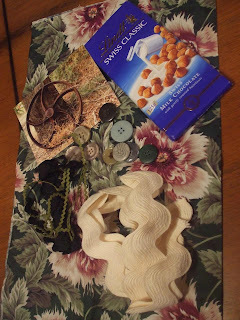 For those of you in the UGLY SWAP here is what my partner Peg sent for me to work with - I am afraid that the fat quarter that I sent her was much much uglier but I forgot to take a photo of it before I sent it. So today I am going to leave Peg's UGLY sitting in front of me on the sewing table to see if any inspiration hits - Wish me luck !! Do hope you are feeling better soon. This swop looks very interesting. Love the big buttons. I'm staying glued to see what you come up with. Prayers are going up....take care. I will surely be praying for you, sweets. Darling thread holder! Oh Fiona! I do hope it turns out to be nothing too serious! OH Fiona My heart goes out to you I know what it is like when you have to have tests done and you dont know why I am sure everything will be all right My prayers are with you. Thinking of you. Prayers are said. So sorry to hear you haven't been well Fiona , I'll be thinking of you this week and hoping you are on the mend . My prayers go with you! I do hope that you are better soon Fiona...you are such a sweet lady! Hope everything goes well with the next test. I get so many tips from your site. Wishing you well. You have been in my thoughts, wishing you the best.....I think I have been inspired, what about you - still thinking?? ?